With Smartsheet and Zapier, Deco Windshield streamlined it's new employee process saving time and effort across all 140 locations. For any enterprise, the effective hiring and training of talented employees is critical to success. Imagine the challenge for DECO Windshield Repair, a large Canadian company with a hiring and onboarding strategy that must flex around extreme weather. Because harsh Northern winters keep the customer-facing side of the business closed for several months of the year, DECO -- with more than 140 locations across six provinces in Canada -- relies on a large seasonal field staff of more than 200 that requires a concerted recruiting and re-hiring effort each spring. 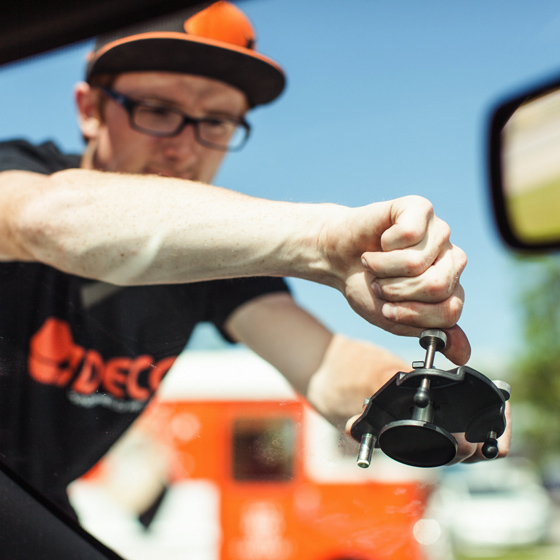 DECO needed to streamline its new employee documentation and training processes to make most efficient use of the limited time available between hiring new staff and opening its windshield repair locations for new spring sales. Chau started out as a field employee, when much of the company’s recruiting and onboarding work was being done with pen and paper. Hiring managers read through reams of printed applications and resumes to confirm who met requirements such as having their own car. Location managers sat down with new hires to work through payroll paperwork and collect signatures, then handed them a thick stack of sales training materials to master before starting to work with customers. When he joined the corporate team, Chau knew that DECO could bring most if not all of this manual work into the digital era. DECO was already using Smartsheet, but not as effectively as possible, Chau said. Administrative staff were creating sheets to simplify individual tasks but not connecting parts of larger processes. Seeing an opportunity to save time and effort, Chau dove into Smartsheet training resources to learn how linking sheets, filtering data, and reporting could benefit the company. He soon found that by integrating its Smartsheet solution with specialized online services it was already using, DECO could take its business workflow — from recruiting to sales to offboarding at the end of the season — and make it almost entirely paperless. Today DECO Windshield Repair’s application, onboarding, payroll and offboarding processes are managed through automated data collection and filtering, connected through Smartsheet. Using an online application form integrated with Wufoo, job applicants quickly submit their experience, personal information, and professional goals. The information is captured by Smartsheet and integrated with Zapier to filter qualified applicants based on the specific attributes local managers are looking for to round out their team. Once hired, new employees submit key employment information such as address or banking information via an online form that automatically populates Smartsheet data sheets for the teams who manage HR and payroll. Saving time on administrative processes means more time is available to train employees on their new duties. When the new employee’s record is complete, the Smartsheet solution automatically starts emailing employees sales training information in stages to prepare them for their new roles. The Smartsheet solution continues to save time after employees have settled into their new roles. Tracking sales data is an important part of both performance evaluation and pay for DECO field staff. Managers use Smartsheet to capture payroll information for each pay period, which is appropriately sorted and exported to DECO Windshield Repair’s payroll system. DECO can process outgoing employees more quickly as well. When a manager marks an employee as inactive in the data sheet, a simple offboarding form is automatically generated to capture the correct status updates. This saves a great deal of administrative time when the majority of locations close down as winter approaches and the corporate team shifts into planning mode for the distant spring. Chau says the shift to a digital process has improved business processes not only for the local managers but for the entire administrative team. Learn more about integrating Smartsheet with other solutions or contact us for more information.